The loyal cricket fans in Sri Lanka who are already in a state of depression was in for a rude shock which no doubt adds salt to injury from none other than the head coach of the Sri Lanka cricket team. Following the announcement of the squad for the Asia Cup 2018 and the selections that are getting bizarre and murkier by the day criticism has been mounting by the day from all quarters raising serious question on the criteria for selection adopted by the current selection committee in which Chandika Hathurusingha, the head coach is a sitting member. When players who are doubtful in participating in the entire duration of the tournament are picked (Akila Dananjaya) and players who are dropped on form are later named as replacements and stand-by players (Niroshan Dickwella) it is no surprise that such irrational decisions attract widespread criticism. It is quite obvious that he is unable to bear the level of pressure being exerted which has prompted this outburst over his twitter handle. Venting over social media tools such as twitter has been made fashionable since of late by US President Donald Trump. He in his capacity as the most powerful person in the world can get away hurling insults at his detractors. However, Hathurusingha is in no position to pour such scorn on the cricket loving public in this country. He was brought in by a misguided administration projecting him as the Messiah who was going to take Sri Lanka to its second World Cup victory. But his achievements since assuming duties have been far from what was expected and need not be stated here. In fact, he is arguably the highest paid government official and when there is much public disgruntlement over the salaries paid to higher ups at Srilankan Airlines, it will be a matter of time before the Joint Opposition starts demonstrating on the streets demanding his removal unless he lives up to his promise. 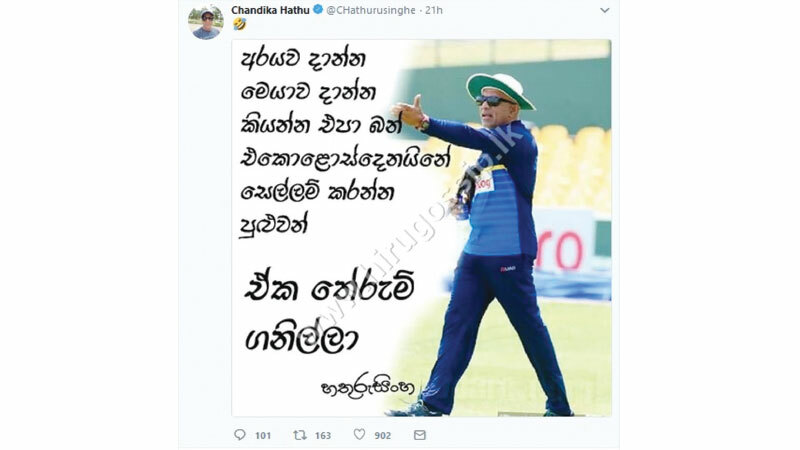 In such a backdrop Hathurusingha is in no position to insult the cricket loving public in ungentlemanly vernacular language. He should offer an unconditional apology to the knowledgeable cricket loving public for this latest folly. In the absence of an apology forthcoming the Minister of Sports should take immediate measures to take disciplinary action against his behavior. The Minister should also take part of the blame for such behaviour as it was the Minister who allowed him to get away from the serious breach of discipline when the team manager and the national captain had paid a heavy price. • In the process of the selection of the team, the selection committee has to obtain the views of the National coach (if a coach is appointed) and the Captain (if applicable for the game) before taking decisions. • However, the national coach and the captain should be released after the discussion before finalizing the team by the Selection Committee. It is abundantly clear that drafting in the national coach to the Selection Committee directly contravenes Sports Law No.25 of 1973. It is common knowledge that a condition that was laid down by Chandika Hathurusingha before accepting the position of head coach was that he be given control over selections. The misguided administration who hired him acceded to this condition by pulling the wool over the Minister of Sports and misleading him to appoint him to the committee on the pretext that the constitution of SLC was amended to accommodate this stance. What needs to be understood by the Minister and the public at large is that the law of the land supersedes all else. The Minister being a President’s Counsel will no doubt be familiar with the legal framework. What the Minister needs to be enlightened on is the fact that on all six occasions that our proud cricket team advanced to the final of a World Cup event it was under the stewardship of foreign coaches. None of these gentlemen interfered with team selections which is outside their purview. The sitting selection committees of the time were in firm control of selection/s which were done purely on merit upholding the integrity and independence of the process. Having demanded control over team selection Hathurusingha has brought about the current state of discontent upon himself. Therefore, he has only himself to blame and should stop venting his frustration on the cricket fans. On the other hand he should be taking a leaf off Trevor Bayliss and Paul Farbrace two gentlemen who delivered on their promise during their short tenures with SLC, and are also doing a wonderful job with the English cricket team at present. The Minister of Sports is on record singling out perceived malpractices in sports bodies following the Asian Games debacle in Indonesia. The Minister who holds the powers to rectify these anomalies and clean up the sports circuit. Such an initiative from the Minister no doubt will do wonders for his political stock as well.